This article is about Sangheili title. For Forerunner title, see Councilor (Forerunner). High Councilor is a high-tier Sangheili political title within the Covenant. During the Covenant's early years, only the Hierarchs served on what would be the High Council. Eventually, the Council was established and organized sometime in 850 BCE and consisted of a select number of San'Shyuum and Sangheili governmental delegates—the precursors to the Sangheili High Councilors, as outlined in the Writ of Union. In 2525, the Minister of Fortitude, the Philologist Hod Rumnt, and the Vice Minister of Tranquility went before the High Council and announced their intentions to replace the current Hierarchs of the Covenant. Although they were initially reluctant, they accepted the bid and the three became the new Hierarchs. In 2535, the San'Shyuum High Councilors reorganized the Covenant fleet, against the desires of the Sangheili Councilors. After the High Prophet of Regret's death on Installation 05, the High Prophets of Truth and Mercy publicly replaced the Sangheili Honor Guardsmen with the Jiralhanae. This decision was not approved of by the High Council, and the Sangheili High Councilors viewed this as a violation of the Writ of Union and threatened to resign from the High Council. During the Battle of Installation 05, the San'Shyuum and Sangheili High Councilors were to meet in the Control Room of Installation 05 to allegedly witness the activation of the installation and the beginning of the Great Journey. However, only some of the Sangheili Councilors and former Honor Guardsmen—particularly the ones that opposed the Changing of the Guard, but were unwilling to resign from their positions—had arrived at the Control Room. Suddenly, a large contingent of heavily armed Jiralhanae, led by Captain Melchus, entered the Control Room and proceeded to massacre the Councilors, following the orders of the High Prophet of Truth as part of his plan to replace Sangheili with Jiralhanae in Covenant society. The surviving High Councilors, along with the rest of their species, did not hold unified opinions on how to proceed following the Great Schism. Some joined Thel 'Vadam's cause to ally with the humans, though others attempted to bring what remained of the Covenant Empire under complete Sangheili rule, scrambling to grab power and influence when possible. Following the Human-Covenant War, some High Councilors served in Jul 'Mdama's reformed Covenant faction, while others led small, independent factions with reclaimed Covenant assets. Councilors during a High Council session. The Councilor is one of the highest positions attainable by a Sangheili warrior, whether militarily or politically, although the title of Arbiter is more culturally significant in Sangheili society. Councilors act as members of the Covenant High Council, along with the San'Shyuum High Councilors. Their power is derived directly from the High Council, under only the Hierarchs, making them some of the most important roles held in all of Covenant society. The Sangheili Councilors were also involved with the Hierarchs' Ascension ceremony. All the Councilors would gather before the newly-appointed Hierarchs and one Sangheili Councilor would ask for the names of each High Prophet. Because of the militaristic culture of the Sangheili, many Councilors had backgrounds as high-ranking members of the Covenant military. It was common for Evocati, in particular, to pursue a career as a Councilor. Because warfare is the primary purpose of Sangheili participation in the Covenant, Councilors are extremely skilled warriors in almost all forms of armed and hand-to-hand combat. 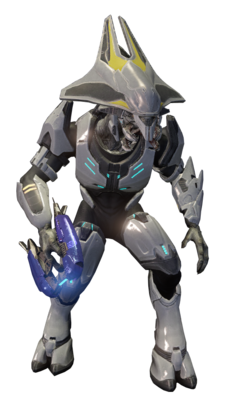 As Sangheili are ranked according to the numbers of kills obtained, Councilors are likely to have served in the military long before achieving their title. Councilors typically carry the iconic energy sword, which also serves as a symbol of their aristocratic status. They are also known to wield plasma rifles. To protect them on the battlefield, Councilors are equipped with an extremely durable harness, similar in appearance to the standard issue version, but with superior armor compared to that worn by lesser ranks, similar to that of the Special Operations Sangheili in Halo CE. Their energy shields are capable of taking an enormous amount of damage, equivalent to the shields of an Evocatus, however unlike Evocati they do not falter when hit with a melee attack. Councilors are easily recognizable by their ornate headdresses, which cover most of their face and extend far behind their heads. Their armor is a pearlescent white in color, similar to the armor worn by Sangheili Ultras. The headdress worn by Sangheili Councilors noticeably resembles the head crest of the Xenomorph queen from the movie Aliens. A model of a Councilor for Halo 2: Anniversary. A Councilor in Halo 2. A Councilor wielding an energy sword. A Councilor wielding a plasma rifle. A Councilor shown from behind. A Councilor in Halo 2: Anniversary. The death of the Councilors. Two Councilors in the Bastion of the Brutes.